Designed with customer input at every stage of the design process, the JCB wheel loader range is designed to meet owner’s priorities. Namely safety, efficiency, ease of use, ease of maintenance, productivity, performance, reliability and comfort. As a result, all JCB loading shovels, from compact hydrostatic drive 2-tonne models, to giant 24-tonne power shift machines, all share the same DNA. 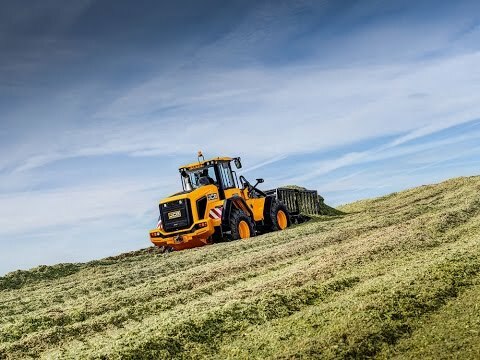 All Agricultural loading Shovels are built specifically to do the job in hand from the JCB 403 with its compact size ideal for livestock and equestrian applications to the mighty JCB 435S which is really king of the clamp in large scale silage operations with its huge 230hp engine, massive torque, fast cycle times, limited slip differentials, excellent traction and of course the all new Command Cab to give the operator a home from home experience for those long days at the wheel. Each of the JCB wheeled loaders shovels is designed to be productive above all else, with supreme reliability, low maintenance requirements and great versatility. After all, a loading shovel is always in demand for all sorts of applications, so JCB offer a variety of model configurations to hone machinery to your exact requirements. Not to mention whole ranges of options and attachments.